A loyal follower of my blog, named Ed, graciously volunteered some of his time for an Albert Decaris Stamps! interview. Enjoy! Albert Decaris Stamps! : Thank you very much for participating in my "I Interview..." series. A: About 3 years ago. A: I have always collected paper ephemera and became interested in stamps. I had started a collection of German stamps and I was looking for more information and came across the 'Collecting by Engraver' posts on the Stamp Community Forum on the internet. It introduced me to Decaris as well as many other engravers. Q: What is your favourite Decaris stamp, and why is it your favouritre? 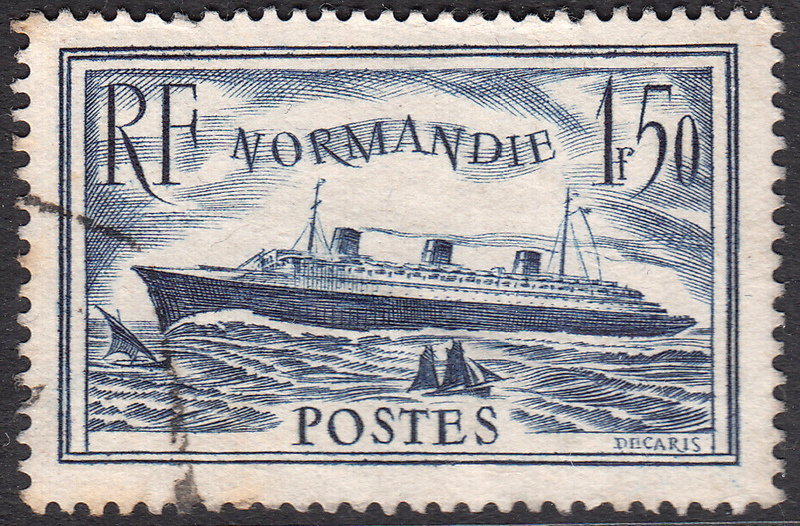 A: If I had to pick just one it would be the S.S. Normandie passenger liner issued in 1935. A: The internet, a local stamp shop, and a monthly stamp market in Ottawa, where I live. A: The internet, namely the French site phil-ouest.com. Fortunately I grew up in Montreal, which is predominantly a French speaking city, so my French is pretty good. 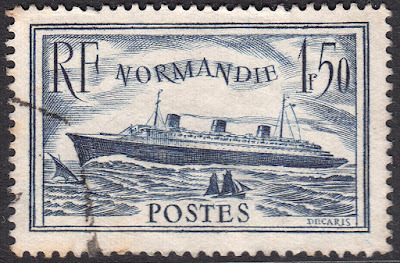 A: The Normandie stamp of 1935 - a used copy. Then I replaced it with a mint copy. Q: When it comes to definitives in multiple values and omnibus issues with the same engraving, do you collect everything there is or do you collect just one example of each engraving? A: I usually prefer to stick to one example of the stamp issue unless there is a re-release of the same design with subtle changes i.e. the Decaris Luxembourg stamp is a good example, and there are times all the other values are sold as a group, so I usually share those 'extras' with other collectors. Once you start collecting all values, it can get a bit crazy. A: Quite a few. I collect most of the French engravers, Slania, and a handful of the other European engravers as well. But my interest in engraved stamps begins to wane after the early 1980's. A: I like First Day Covers - especially signed ones. Souvenir sheets. Cinderellas. I also like revenue stamps. The engraving of some of the earlier Canada Revenue stamps are quite ornate and spectacular. A: Vario-Lighthouse stock sheets that are housed in three ring binders. A: A lot of great examples of engraved stamps are still reasonably priced. Work within your budget. Invest in a good magnifying glass so you get a closer look at the engravers art. Better yet if you have a scanner, scan a stamp at 800-1200 dpi. You'd be amazed at the details it reveals, and at times it brings out the faults. I'd like to thank Ed again for the interview. As always, if anyone else out there wishes to participate, please let me know in the comments.